After a four hour layover at LAX we got on a plane to go to New Zealand. The plane flight was 12 hours long, luckily for us we rested on the plane for a bit and that helped combat the time zone change. When we landed we had to wait in a long line for customs and that took a good while, but we were rewarded when we finally got to the breakfast place called the scarecrow and ate a ton. Yum!!! After eating, and a lot of bad temper from Lu we finally were welcomed in to the warm and full of light apartment. After that we decided to crash and after that we went to eat ramen at a ramen place. Also yum! After that we walked over on to a bus and went to the museum, walking up to the museum we met a very nice lady that worked for the museum and she gave us a tour of the museum! After the incredible tour and some exploring the museum we decided to go home and sleep. The Maori, as you might be wondering, (unless you are a New Zealander)were the first to cross the ocean and settle in New Zealand. The interesting thing about the Maori is that the Maori had sailed across the ocean to new land and the amazing thing was that the Maori had sailed acros the ocean, not in ships like the mayflower but in ships with two pontoons that had a flat deck sitting on the pontoons and that could carry up 100 people at a time. Now enough of that and on to the Maori meeting houses. The meeting houses were used as a community house, or a place of peace, and if you started a fight you would be kicked out until you calmed down. The meeting houses were also considered, and not like a church or a house of worship, a sacred place ,where usually no food was allowed and no shoes were allowed inside and religious ceremonies were held there. 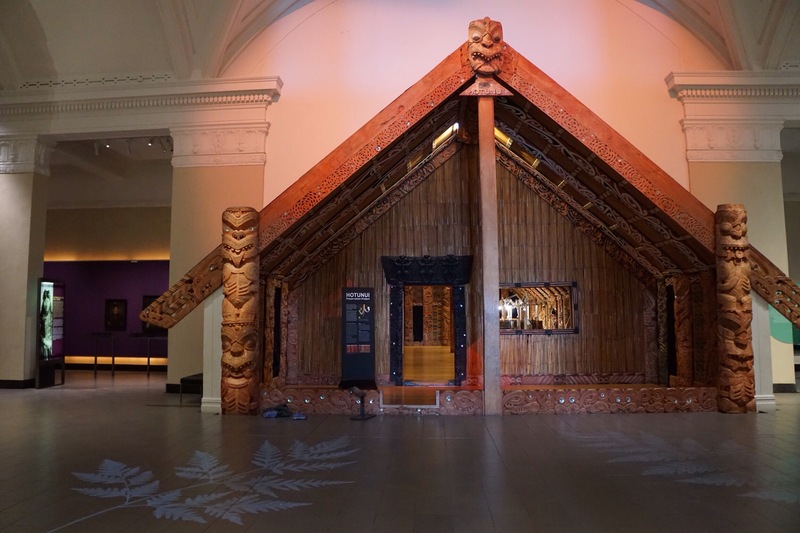 The meeting houses were also called by other names such as a wharenui, whare rūnanga, or a whare whakairo. Also the meeting houses all had a name, and that name was usually a legendary hero, a legendary god, of a famous ancestor. And lastly the houses were sometimes given as a wedding gift. The Maori meeting house,above, was the meeting house that we saw at the museum. The meeting house used to be panted red for the grand opening of the museum but after months of chipping the museum finally got the original color and now they are weaving new panels for in between where the paint was chipped off. Cool how they do that, eh? I like the names of the places you are visiting, especially Coromandel, Whitianga, and Rotorua. I pronounce them out loud so I can hear what they sound like. Where do those names come from? What do they mean? For example, I live in Paso Robles. It’s Spanish for “Place of the Oaks.” Makes sense because there are millions of oak trees around. You can learn a lot about a place by knowing its name. thank you for aski g because it is verry intresting and the answer is that cormeandell comes from india’s coromandel coast and from the hms choramendel that traded maori speers. for whinagata, Kupe was a maori explorer and named the place Te Whitianga o Kupe wich tranzlates in to Kupe’s crossing place. the name rotorua comes from the maori the full name being Te Rotorua-nui-a-Kahumatamomoe which was shortend in to Rotorua. I am really enjoyed reading about your travels so far- I will be a dedicated follower! Eryn loved the picture of Eleanor buried in the sand- she said “I bet her brother did that!”. This, of course, comes from experience. I already miss you guys- you would have loved seeing Tarzan (maybe your mom can show you pictures on my Facebook some time). We are traveling to southern Utah this week- my friend moved there & we are going to volunteer at the animal sanctuary where she is working. It is one of the world’s largest sanctuaries, with 1,700 animals. Our Lion King classes start Aug 22nd- it will be funny to have my favorites, the Fretzes, missing!